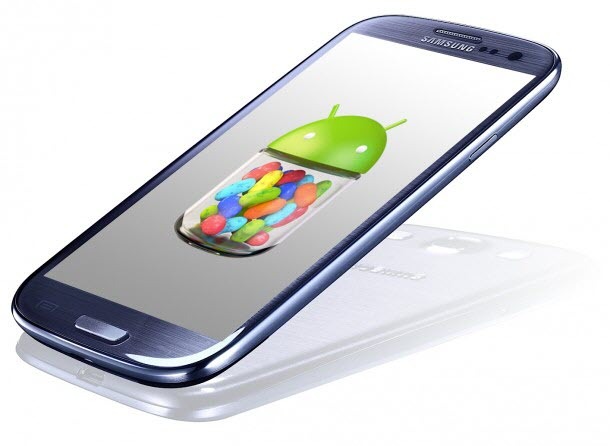 The official Android 4.1 Jelly Bean update is finally released for the Samsung Galaxy S3 users. According to Sammobile, the users in the Poland are seeing the official update notification in KIES, which indicates that Samsung has finally started pushing the official update and other countries should get the update in the following days. The firmware for the official update – XXDLIB has also been released online, which people can use to manually update in case they do not want to wait for the update to roll out in their country. This firmware will work for Galaxy S3’s from any other country. Those who wants to flashing it over a custom ROM might need to wipe the data on their device in order to make it work. (which can be restored later). The guide which we have given below are compatible one and only for international Galaxy S3, model number i9300. It is not compatible with the US variants or other devices. You can check your device’s model number in Settings >> About Phone. If you flash this firmware over a custom ROM or a Galaxy S3 from another country other than Poland, you might need to wipe the data on the phone to make the firmware boot up properly. The SD contents are always safe, so there is no need to back up those. Create backup only for apps and your personal data. So, once you have performed all the above mentioned instructions, you can head over to the next steps where we have summed up a detailed tutorial on how to update this official firmware in your device. WARNING: We and even the developer won’t be held responsible for any damage that takes place to your device while following these steps. So, root your device at your own risk. 1. First download and install the software KIES on your computer, which will install the necessary drivers for the phone. 3. Extract the GT-I9300_XEO_1_20120922093900_w8pdod73hi.zip file on the computer to obtain a file named I9300XXDLIB_I9300OXFDLI1_I9300XXDLIB_HOME.tar.md5 (ignore the file named SS_DL.dll). 4. Download the Odin PC Software. If If you are new to this, Odin is what is used to flash stuff – firmware, kernels, etc. – on Samsung phones. We’ll use Odin to flash the firmware file obtained in step 3. 5. Now extract the above mentioned Odin file to a folder on your computer. 6. Turn OFF your Samsung Galaxy S3 so that it can enter into the download mode. To do so, press and hold these keys together : Volume Down + Home + Power till the screen turns ON. Then press Volume Up to enter download mode. 7. Open Odin by double-clicking on the Odin3 v3.04.exe file which you have extracted in Step 5. 8. Now, Connect your phone to PC now. You should get the message “Added ! !” under Odin’s message box in the bottom left. If you don’t get this message, make sure you installed drivers correctly (using KIES or directly) as given in step 1. If it still does not work, try changing to another USB port on the computer and also use the USB ports on the back if you have a desktop PC. 9. Click on PDA button in Odin, then browse to and select the I9300XXDLIB_I9300OXFDLI1_I9300XXDLIB_HOME.tar.md5 file obtained in step 3 above. 10. Do not make any other changes in Odin except selecting the required files as selecting in step 9. Leave all other options as they are. Make sure Re-Partition check box is not selected. 11. Now, click the Start button to start flashing the firmware on your phone. When the flashing is complete and is successful, you will get a PASS message (with green background) in the left-most box at the very top of the Odin, and the phone will automatically reboot. when you see the Samsung Logo, you can safely unplug the cable. NOTE : If Odin gets stuck on set up connection or at any stage of this process after you have hit the Start button, and does not seem to be doing anything, or if upon completion of the process you get a FAIL message (with red background) in ODIN, then you need to disconnect the phone from the PC, close ODIN, remove battery for 4-5 seconds, re-insert it, turn phone on in Download mode again so as to do the procedure again from step 7. 12. After you get the PASS message and the phone reboots, the phone might get stuck at the booting animation. If that happens, perform the following steps to make it boot. If your phone is already booted, skip these steps. Boot to recovery mode – for which, first power off phone (by removing battery and reinserting it), wait for 5-6 seconds, and then press and hold Home + Volume Up + Power keys together till the screen turns on, then let them go to boot into recovery. Once you are in recovery mode, use volume keys to move the selection up and down and home/power key to select the option. Go to Wipe data/Factory reset and select it. Select yes on next screen. Then, select reboot system now to reboot the phone, which will now boot properly. Congratulations! Your Galaxy S3 is now running the official Android 4.1 firmware.